or Dreaming, the creation era of the world according to Australia's Aboriginal peoples. In those long ago days traditional law, artefacts, languages and landscapes came into being. This ancient heritage has been preserved by story telling which passes vital knowledge from generation to generation to the present. Over 600 Indigenous groups once lived in the Dreamtime continent and spoke at least 300 distinct languages and hundreds of dialects. Ancestral Beings created the landscapes which embody their resting places, sacred sites, stories and totems. And local groups nurture traditional 'country' and themselves spiritually by performing ceremonies along Dreaming tracks or song lines. The oldest evidence of boomerangs in the world is 25,000 years BP found in painted rock art in Arnhem Land, Northern Territory (George Chaloupka, 2008) and wooden boomerangs preserved in peat in South Australia dated to 10,000 years BP. Legendary Dreamtime boomerangs, thrown by Ancestral Beings, created natural features in the landscape and stars in the vast night sky. 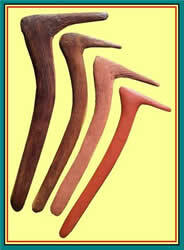 Two main categories of boomerangs originated in the Dreamtime: 'returners' and 'non-returners'. The large range of 'non-returners' includes associated fighting and ceremonial implements. The origin of 'Boomerang' was revealed in Lt. William Dawe's 1790 note book where he recorded "Boo-mer-rit" for "the Scimeter", after talks at Sydney Cove with Bennelong the famous Eora Aboriginal man. Traditional boomerangs were carved with stone axes, adzes and scrapers and many regional variations in size and shape can be found in museum collections. 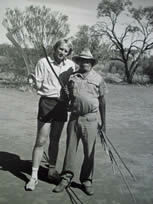 The hunting (non-return) boomerang, like the "karli" of Central Australia’s Warlpiri mob, is a multi-purpose tool. Its uses include clearing grass, poking campfires, striking a wounded animal, digging earth ovens, cutting meat, and as clap sticks to beat time for chanting and ceremonial dances. The famous returner was cut from a natural bend, usually where tree trunk joins lateral root (indigenous makers did not have boards or sheets of timber), the curve forming the boomerang's bend. They were enjoyed by traditional men in games and contests, and smaller versions were made to teach throwing skills to young boys. This ancient application of aerodynamics is why boomerang throwing is regarded as the world's oldest sport. One ingenious use of 'come-backs' was to throw them above flocks of ducks on water. As the thrower cried out like a predatory hawk the circling boomerang acted as a decoy. This frightened the ducks, causing them to fly into large plant fibre nets strung across a waterway, where hiding hunters attacked with ‘non-return’ boomerangs. 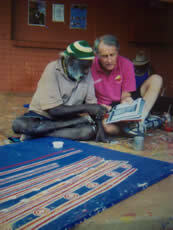 In the 2006 photo opposite Paddy Japaljarri Sims, a Warlpiri elder and Paul discuss one of Paddy's famous Yuendumu School Door paintings (1983) which features 'come-back' boomerangs in a Dreamtime legend, yet 'returners' were not used locally. Hook boomerangs (non-returners) are also known as 'Swan-necked', 'Beaked' and 'Number 7'. Mainly used for fighting yet also for hunting and ceremony. Ceremonial boomerang whose special decoration is rubbed off after sacred use, so the boomerang can be used again around the camp. 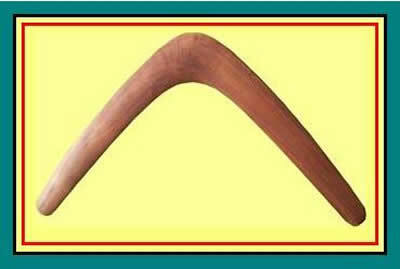 Typical Central Australian hunting (straight-flying) boomerang with longitudinal fluting and red ochre. Classic returner made from acacia tree root with fine wood grain following the curve of the boomerang.